Tuesdays are getting a lot more colorful around here -- and I'm super excited to share why! 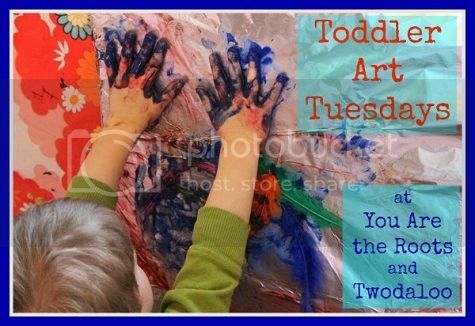 I'm honored to be teaming up with the always fabulous Stephanie of Twodaloo to bring you our new Toddler Art Tuesdays weekly feature. Twodaloo is one of my absolute favorite blogs to browse when I'm looking for creative inspiration. Stephanie, a proud mommy to her adorable two year old twins, is the master of all things creative, sensory and fun (have you checked out the beyond adorable little chef birthday party she threw for her little ones?! ), so imagine how honored I was when she wanted to collaborate with me?! (I may or may not have been a little starstruck. I'm just sayin'.) Stephanie is a big proponent of the importance of sensory play, as am I. There's not a day when I don't have to wash the paint out from Ethan's hair or from underneath his nails, and it's always so nice to get a glimpse into the fun, colorful world that she creates for her little ones, too! I believe that art is so very important, which is why I'm excited to be teaming up with Stephanie to bring you this new series. What to expect from Toddler Art Tuesdays? One of the coolest things about art is personal interpretation. There are several times I line up an art project for Ethan but he comes up with an entirely different way he'd like to utilize the resources to make art. There's never really one answer on how to do an art project. When using your creativity, your options are limitless -- and with a little toddler comes big creativity. With that in mind, Stephanie and I came up with several different themes and will be focusing on one per week to feature here during Toddler Art Tuesday. We'll both be showcasing all of the wonderful masterpieces that our little ones have created on our blogs and will be sharing any tips and tricks for the art projects we've created! I'm so excited to see what kinds of finished masterpieces we all come up with each new week and excited for all of the artistic inspiration that Tuesdays will soon hold around here! Art, Ethan style: To ease into things a little bit before Toddler Art Tuesdays arrives in full paint-splattered swing next Tuesday, I thought I'd discuss a little more in depth how I've introduced art to Ethan and what I've found is most successful for us when it comes to creating art. I briefly touched on it above, but creative liberty is a big thing for us. I don't tell Ethan how or what colors to paint certain things. Should he declare the grass ought to be orange and the sky is turquoise, I applaud his creativity and hang his finished artwork on the wall just the same. If I have materials set out for a certain project but Ethan has found a new, unique way that he has uncovered to create an entirely different piece of artwork, I don't stop and correct him but let him finish the project he's already started working on. Sure, I might have set the cottonballs out for gluing onto something else, but the way he's dipping them into the paint and turning them into stampers is pretty cool and I have to applaud his creativity. For us, anything involving paint seems to captivate Ethan the most. He absolutely loves to paint. I'm not a mess-o-phobic mom and our Tot School room is laden with paint stains, but there certainly can be ways around the mess. Ethan will very nicely sit and paint with brushes for close to an hour and we don't really have any mess issues, but once we start working with textured paints or using his hands or fingers, the mess sort of takes over. Overtly messy projects can easily be moved outdoors for less mess -- but always go with a washable or natural route if you want the colors coming off of those clothes. 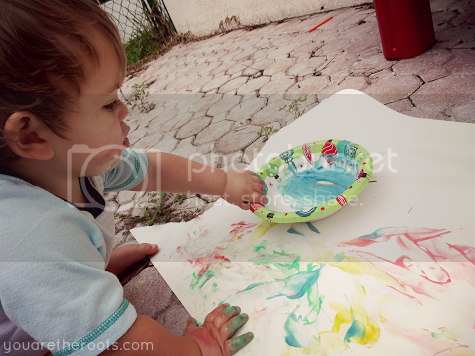 When it comes to painting, Ethan absolutely loves his EZPaint. 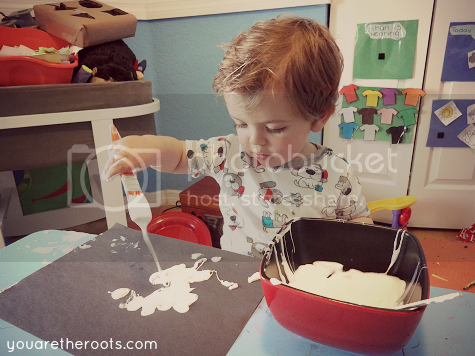 I love his EZPaints because they're easy to travel with and they're virtually mess free. Plus, they offer great fine motor skills practice. The only way I get dinner cooked or anything accomplished is to sit Ethan down with his EZPaint and just watch as he makes masterpiece after masterpiece! Some of our favorite projects we've done would be the baked potato stampers that we made and making blackberry dye to tie-dye a t-shirt. Ethan still talks about both of these projects regularly! Using everyday household items and turning them into a fun project was such a memorable experience for Ethan. I'm so excited to introduce Toddler Art Tuesdays and to be a part of this fabulous series. Ethan and I are looking forward to making and sharing art with you! 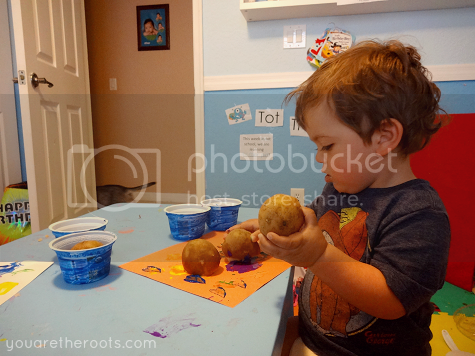 What's first on the Toddler Art Tuesday agenda? Next Tuesday is all about fingerpaint! I hope you're all ready to make some art! I'm looking forward to your new Tuesdays posts! There is always so much creativity going on here and I'm glad that you are taking the time to share more. My kiddos respond so well to art and it is really huge in our home. Looking forward to more inspiration. It is clear that little E is loving the process of creating!